US government officials have labeled Central American young people arriving in recent years as everything from representatives of a humanitarian crisis to a threat to national security. Under the current administration, the president has gone as far as to refer to them as animals, encouraging police to be rough when handling them, and separating them from their parents. Without geo-political and historical contextualization, this type of labeling and rhetoric presumes that Central Americans are inherently violent and crisis-ridden. Most importantly, it has consequences for how Central American youth are perceived and treated. 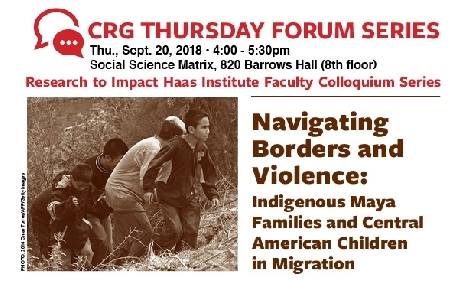 In this presentation, I will explore the systematic practices of nation-states that fail to protect the human rights of migrant Central American children. With high crime rates and widespread impunity, home countries in northern Central America lack strong education and labor opportunities to keep young people occupied and healthy. Moreover, youth are criminalized and often put on pathways to gang involvement. Although the Mexican state has strong and protective laws on the books, in practice, authorities there fail to protect migrant Central American children while they are in transit. Since 2015, Mexico has been detaining and deporting more Central American children than the United States. Migrant youth who make it to the United States may find themselves in immigrant detention and then quickly deported or living through lengthy and uncertain asylum application processes. These multiple forms and locations of violence play key roles in determining the well-being and experiences of Central Americans. The growing presence of indigenous Maya students from Yucatan, Mexico, in K12 schools in California constitutes a recent demographic change of the last 10 years. Forced out of their lands as a result of Spanish colonial rule in the 15th Century, indigenous families in Yucatan continue to live within the structure of a colonial formation based on settler land appropriation now expanded into foreign corporation supports and the biopolitics of tourism. These forms of power have produced circuits of indigenous migration to global cities in the north as strategies of resistance and survival against continued processes of erasure and displacement. In this talk I draw from my linguistic and educational anthropological study at a K5 elementary school in northern California with a student body representing regions across Mexico and Central America and where roughly 25% of the student population is from Yucatan to discuss the ways that families manage school bureaucracies of the public education system and influence meanings and practices of education at the school. The families at the school resist homogenizing processes of Latinization and establish panethnic solidarity with other immigrant groups to enact, negotiate, and support pedagogies of migration  lessons that parents consider beneficial for their children to witness and learn and which highlight histories of migration, resistance, violence, and of inequalities at the hemispheric scale. At a time when the United States confronts head on its interventions of settler colonial complicity in Central America and Mexico, a closer look at how displaced indigenous families in migration seek a better education for their children can help amplify social and educational opportunities for these students in schools.